You’ve got a dinner party coming up and you need a break from traditional hors d’oeuvres. You want something that will knock peoples socks off! Beef Jerky is probably not something that makes the list of “common” hors d’oeuvres we know. If you’re thinking ” I can’t believe these rednecks are suggesting this” …. stop and think for a second… if you were going to serve chocolate chip cookies, you probably wouldn’t get “Chips Ahoy”, would you? You would bake up a fresh batch of cookies. Serving them while they’re still warm, taking everyone down memory lane. 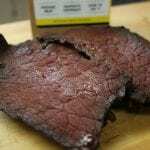 Why should beef jerky be any different? And it’s easier to make than chocolate chip cookies… Win/Win. 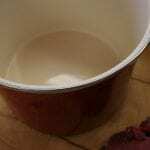 DIY Seasoning Kits – Where we start! 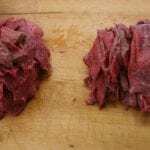 Start with 5 pounds of lean beef rounds from the meat market. All fat must be trimmed completely from the meat. Next, get the meat cold. Slightly frozen is perfect, but not so frozen you can’t cut it. Slice the meat, across the grain, into approximately 1/4” thick slices. 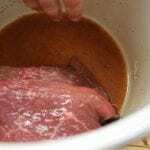 Using a Lucky Beef Jerky DIY Cure and Seasoning kit, mix one packet of seasoning and one packet of cure with a cup of cold water and stir until the kit is thoroughly dissolved into the mixture – (add additional seasoning: liquid smoke, etc, if one wishes). 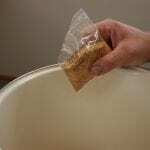 Mix the meat with the marinade and put it in a large Ziploc bag and let it set for 24 – 36 hours. Once the meat has had a chance to marinade, lay it out on a drip rack on a cookie sheet so that no two pieces are touching. Now you’re ready to cook. Set your conventional oven to 185°F (or it’s lowest setting above165°F) leaving the top of the door cracked to promote convection, allow the meat to cook until its internal temperature reaches 165°F. 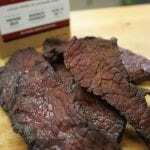 The great part about this jerky is that it can sit in the oven at the low temperature until you’re ready to serve, which gives the host or hostess the opportunity to have some flexibility of schedule. The results will amaze. Better than any store bought jerky you have ever tried! Nebraska Star® Beef offers 4 different flavors of DIY Seasoning kits: Original, Peppered, Red Pepper and Teriyaki. 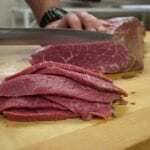 Well trimmed (or “peeled”) beef rounds can be obtained at your local butcher shop. 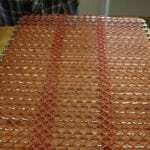 It’s advisable to have the butcher trim the rounds as it will save a great deal of time. Here’s a close up of the sliced beef round. — at Nebraska Star Beef. 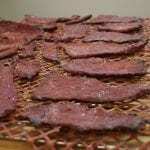 For today’s feature Friday, we’ll be making “Original” and “Teriyaki” flavor jerky. We split the sliced beef round into two 5lb batches. 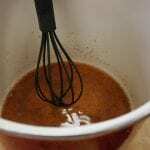 The next step is to mix the marinade. It’s important to use a container that is non-metallic, as metallic containers can impart a metallic flavor to the jerky. 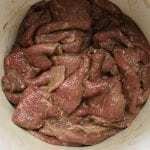 Once mixed, allow the meat to sit for 24 – 36 hours before cooking. This allows the sodium nitrate to fully penetrate the meat, it also gives the seasoning time to “bloom” and deliver the best flavor possible. After the jerky has marinaded for a couple days, it’s time to lay it out and cook it. We’ll be cooking this batch in our smoker. 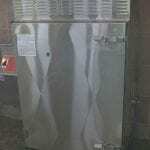 It’s also easy to cook jerky in a conventional oven. — at Nebraska Star Beef. 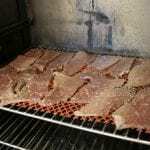 When laying out the jerky, allow a little space between each of the slices and make sure that none of the pieces are folded or covering other pieces of meat. This will allow for the most consistent cooking possible. Consistent cooking makes the best jerky. 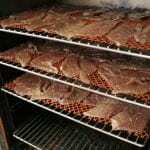 When the jerky is all laid out, it’s time to get it into the smoker or oven for cooking. 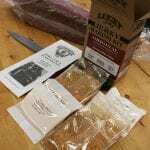 Lots of folks believe there is some magic formulae for cooking jerky… there isn’t. It’s the simplest thing in the world. Cooking times will vary on a number of things…altitude, actual temperature of the oven, the thickness of the meat, the temperature of the meat when it was put into the smoker…. BUT the one constant is the internal temp of the meat. If you don’t have one, get a digital meat thermometer before you start cooking jerky. When the internal temperature of the meat reaches 165F the jerky is done. 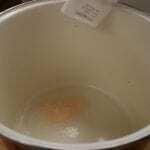 If you want it drier, cook it to a higher temp… if you want it more moist, pull it at 160F.. any lower than 160F is not fully cooked – by the USDA definition. 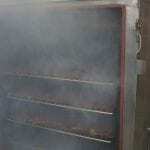 This is one of our favorite sights around the office… the smoker door is opening up and fresh jerky coming out. Close up of the last shot. 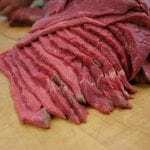 September 13 · “Teriyaki” jerky close-up….